My grandmother always had a special dish for each grandkid. Mine was buttery new potatoes and half-runner green beans, but my sister’s was always corn pudding. Because she was my sister, I decided I hated corn pudding; however, I recently got over myself and decided to give it a try. And let me just tell you: it is amazing, and this is our favorite recipe. 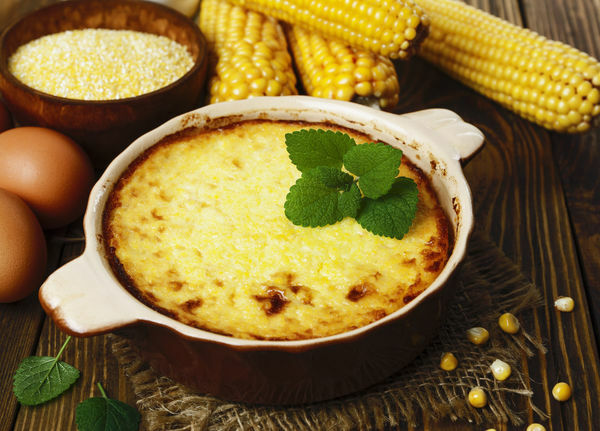 Many of us in the South have to decide between creamed corn or corn bread, but the good news is this corn pudding recipe has the best of both. Scroll down for the tasty details! Cut off kernels from cobs in to a large bowl. This should amount to about six cups. Scrape milk and remaining pulp from the cobs, then discard cobs. It’s important to get as much as possible off the cobs. Gradually add sugar to the egg mixture and whisk it until it is smooth. Add in the corn and stir. Pour mixture in to a lightly greased 13″x9″ baking dish. Bake at 350 degrees for 40-45 minutes or until the top is set and lightly crusted. Let stand for 5 minutes.